U.S. Economy Added 271,000 Jobs In October, Beating Expectations : The Two-Way The unemployment rate dipped slightly to 5 percent, according to the report from the Bureau of Labor Statistics. 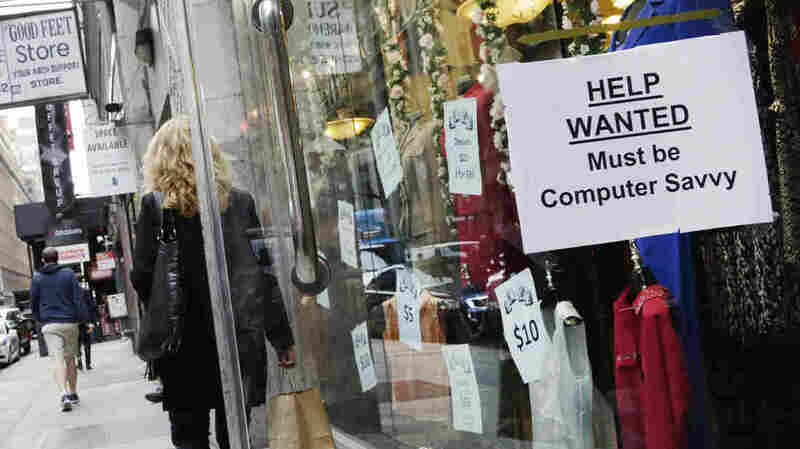 A shopper walks past a store with a "Help Wanted" sign last month in New York. The Bureau of Labor Statistics reported a 9-cent rise in the average hourly earning rate for October. In a jobs report that may influence the Federal Reserve's decision on interest rates, the Labor Department says that 271,000 jobs were added in October. The unemployment rate fell slightly to 5 percent, according to the report from the agency's Bureau of Labor Statistics. It's the biggest one-month jobs gain in all of 2015, according to Bloomberg News, which adds that the strong result is one of the positive signs the Fed's economists "are looking for as they consider a year-end boost in borrowing costs." Friday's announcement tops economists' consensus expectations, which had forecast a modest gain of about 180,000 jobs. Speaking in Congress this week, Federal Reserve Chair Janet Yellen left open the possibility of an interest rate hike, while also saying it would be "very gradual." Citing good economic results, Yellen said there is a "live possibility" that policymakers might raise rates when the Fed meets in mid-December. Last month, the Labor Department reported that only 142,000 jobs were created in September, with unemployment holding at 5.1 percent. With today's announcement, the BLS said the job-creation number was being revised to 137,000. October's job growth occurred "in professional and business services, health care, retail trade, food services and drinking places, and construction," the Bureau of Labor Statistics says. As for wages, the month also brought a 9-cent rise in the average hourly earning rate, with workers on private nonfarm payrolls now making an average of $25.20, according to the BLS, which adds that for the group, "hourly earnings have risen by 2.5 percent over the year." The agency also says that the number of people who are "involuntary part-time workers" due to reduced hours or the difficulty of finding a full-time job "edged down by 269,000 to 5.8 million in October."